Voice Insights for Carrier and SIP calls provides analytics for calls on carrier and your SIP networks all around the world. 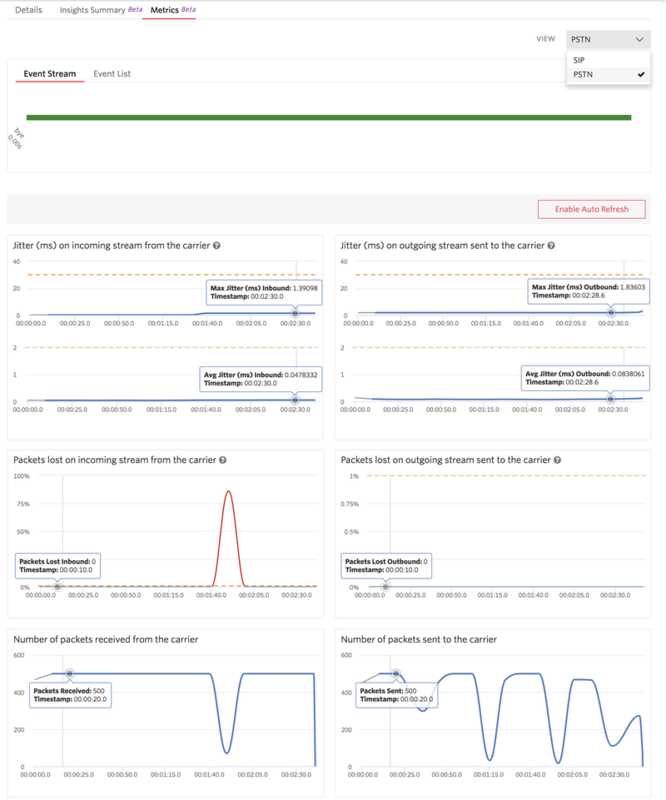 By enabling Voice Insights for both Carrier and SIP calls, you’ll get real-time network metrics gathered, SIP events, and the end-user’s carrier and SIP information for all calls connecting to Twilio. Login to Twilio Console. If you're logged into a subaccount by default, you'll need to switch to your master account as shown. Navigate to Programmable Voice from the left navbar. Navigate to Settings under the Insights(Beta) section. initiated This SIP response indicates that a client is being invited to participate in a call session. ringing This SIP response indicates that the destination user agent received INVITE, and is alerting user of call. in-progress This event indicates that the call is connected. The following graphs contain the network metrics on the streams between the carrier/SIP endpoint and Twilio. The metrics are broken down by the stream that Twilio is receiving from the carrier/SIP endpoint and the stream that Twilio is sending to the carrier/SIP endpoint. If the call contains both a Carrier and a SIP side, you have the ability to toggle between the two to see the metrics for the chosen side. Network metrics are collected every 10 seconds, and graphs are available for calls that last longer than 20 seconds. Max and Average Jitter on incoming stream from the participant Jitter is the variation in latency on the network. It is measured in milliseconds. High jitter is likely to occur on either slow or heavily congested links and negatively impacts call quality. As per ITU standards, jitter should be less than 30 milliseconds. This graph shows the max and average jitter on the audio stream received at Twilio from the carrier/SIP endpoint for this callSid. Each datapoint represents max and average jitter over a period of 10 seconds of the call. Max and Average Jitter on outgoing stream sent to the participant Jitter is the variation in latency on the network. It is measured in milliseconds. High jitter is likely to occur on either slow or heavily congested links and negatively impacts call quality. As per ITU standards, jitter should be less than 30 milliseconds. This graph shows the max and average jitter on the audio stream sent by Twilio to the carrier/SIP endpoint for this callSid. Each datapoint represents max and average jitter over a period of 10 seconds of the call. Packets lost on incoming stream from the participant This graph shows the percentage of packets lost on the media stream received at Twilio from the carrier/SIP endpoint for every 10 seconds of the call. Packet loss percentage should be less than 1%. 通話相手に送信された送信ストリーム上で失われたパケット This graph shows the percentage of packets lost on the media stream sent from Twilio to the carrier/SIP endpoint for every 10 seconds of the call. Packet loss percentage should be less than 1%. 通話相手から受信したパケット数 This graph shows the average number of packets received by Twilio from the carrier/SIP endpoint for every 10 seconds of this call leg. 通話相手に送信されたパケット数 This graph shows the average number of packets sent by Twilio to the carrier/SIP endpoint for every 10 seconds of this call leg. Insights summary is typically available within a few seconds after the call ends. This section contains details on the call participants, connection time, and disconnection method. From The from section denotes the caller. This is the participant who initiated the call. To The to section denotes the callee.This is the participant that was called. 切断側 Which side disconnected the call. This will be either the caller or the callee. Device End user's device type could be Landline, Mobile or VOIP. User Agent This is the SIP User Agent for the call. SIP Call ID This is the SIP Call Identifier for the call. シグナリングIP This is the pair of signaling IPs (Customer and Twilio) used for the call. メディアIP This is the pair of media IPs (Customer and Twilio) used for the call. Trunk SID This is the SIP Trunk SID used for the call. Is this data available using REST APIs? REST APIs for Carrier/SIP Insights will be available soon. Currently, data can only be viewed through Twilio Console. How do I analyze this data for my entire account? We are actively developing aggregates dashboards for Carrier/SIP Insights. These dashboards will enable you to view and analyze your data for your each subaccount. How do I view this data for multi-party conferences? Conference view combining data from all the legs of the call will be available soon. We would love to hear from you. Please reach out to us via the Twilio Support team, and we'll get in touch with you. Is Twilio always collecting the data? In-call network metrics, end-user carrier/SIP information, and call metrics are collected and indexed only when customers opt into using Carrier/SIP Insights.